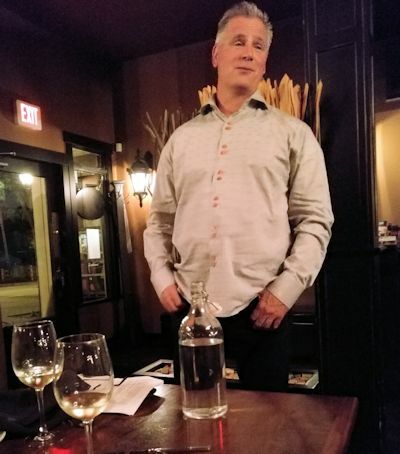 Barbara and I attended the Seaside Pearl Farmgate Estate Winery's (Abbotsford) first wine dinner held in conjunction with Eighteen-27 Restaurant under the guidance of Chef Jordan Ratcliffe . The amazing meal began with Amuse Bouche paired with Seaside Pearl's Daffodils Sparkling Wine which has its own unique flavour and is named for the many daffodils that grow in the area. Neither Barbara nor I are sparkling wine fanciers but we do like this one. It works well for patio sitting on a hot afternoon. Among the notable guests at the event were Winemaker/Consultant Daniel Bontorin and Marketing Consultant Cindy Ferrie. The event was hosted by winery owners Allison and David Zimmerman; accompanied by their son and daughter. 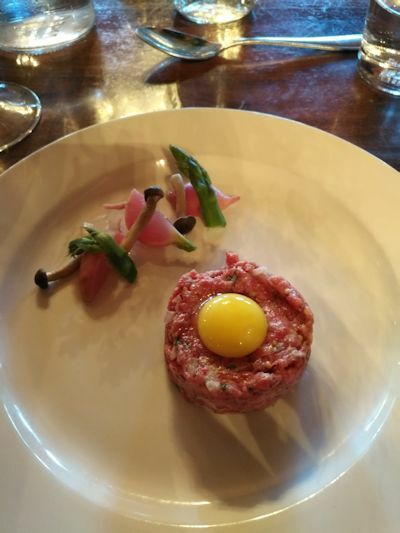 The first course was Smoked Beef Tartare topped with a quail's egg and paired with Landing Road 2016, a full bodied red blend that lingered on the pallet. It worked perfectly with the beef and egg. 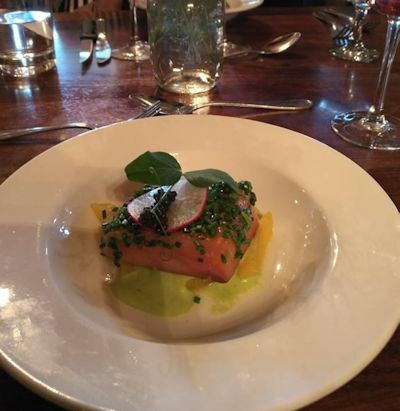 Next to appear was caviar topped poached salmon paired with Magnolias Rose 2017 a perfect match! 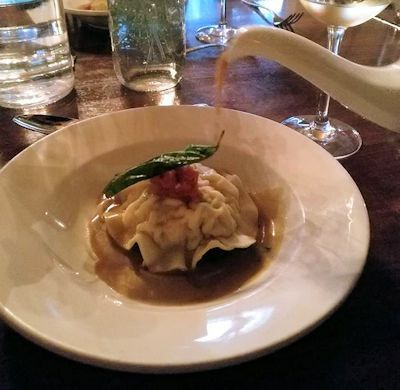 The third course was Lobster Ravioli with a delicious sauce that was paired with a Charlotte Estate Petit Milo 2016. I don't eat shellfish which meant Barbara got two, she was happy about that and commented that I didn't know what I was missing. 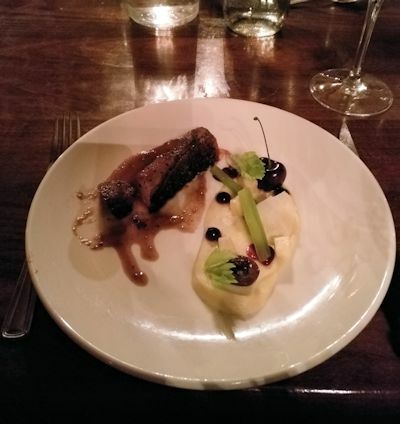 The fourth course was Roasted Duck Breast paired with Petit Verdot 2016 Chef Jordan did an excellent job of preparing the duck and matching it to this fine wine. The whole meal was exceptional the duck ranked five star, and pairing it with the Petit Verdot was definitely the right choice. To complete four hours of fine dining Chef Jordan served what he called a Classic Apple Pie, which reminded me more of an apple crumble. As I missed out on the third course I was offered a second piece of pie which I did not turn down! 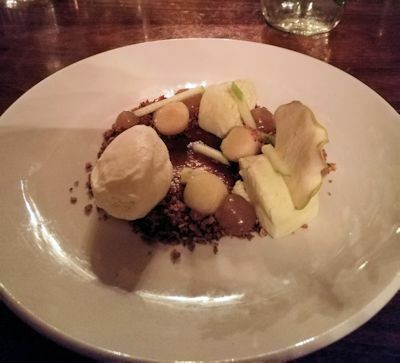 The pie was paired with Seaside's Fraser Valley Gold Chardonnay 2016, which complimented the tartness of the apples and the sweetness of crumble. 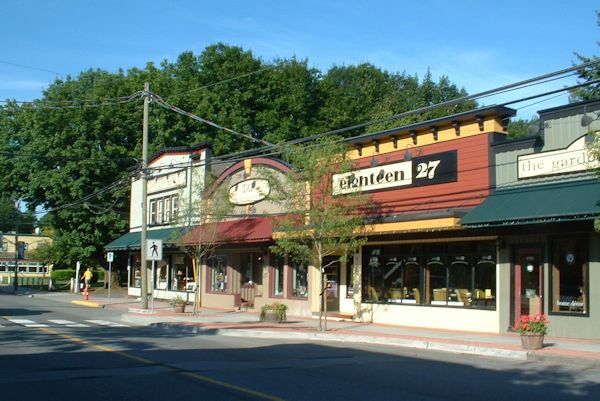 * Fort Langley is a village community that forms part of the Township of Langley in British Columbia, Canada. It has a population of 3,400 and is the home of Fort Langley National Historic Site, a former fur trading post of the Hudson's Bay Company. Lying alongside of the Fraser River, Fort Langley is at the northern edge of the Township of Langley.